Sheidow Park is a relatively new suburb; the place is old but the housing was only introduced in the 1970s. It’s a popular place for families as it is surrounded by beautiful country but close to the CBD. Skip bins Sheidow Park are always in high demand due to the amount of growth this area is seeing. Best Price Skip Bins are in a good position to provide skip bins Sheidow Park as we have been well-established in the area for many years. We offer a unique service to our customers in that we always provide the cheapest skip bins available. Sheidow Park skips are a great way to sort out your home, business or garden if you have accumulated too much junk. When you order with Best Price Skip Bins, you will find the process simple and because we shop around amongst our many skip industry contacts, you’ll also find us very, very affordable. What can you put in skip bins Sheidow Park? There’s not a lot you can’t put in Sheidow Park skips! 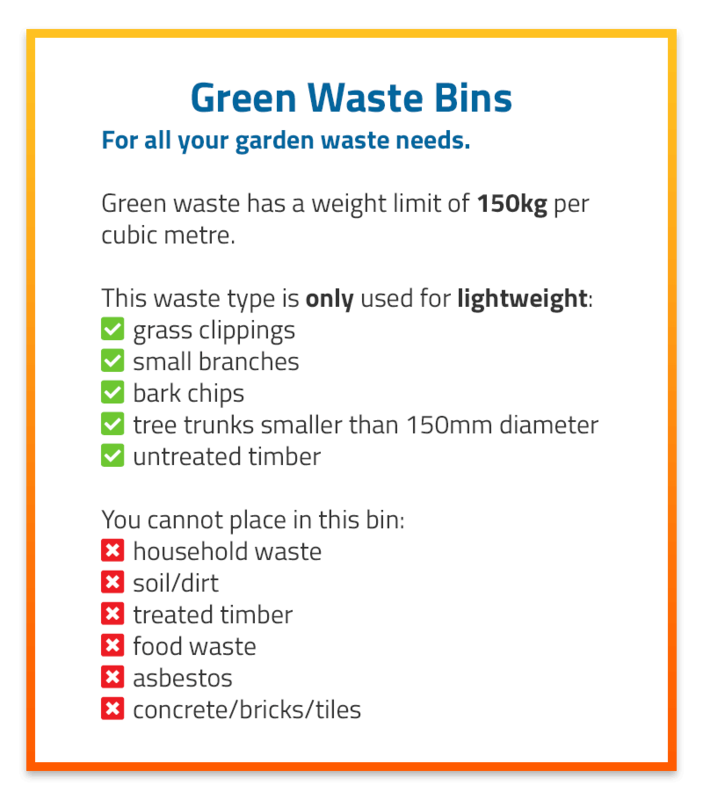 We can collect most types of waste, including general waste, green waste, concrete/bricks, soil and even mixed waste. You might wonder why we try to keep waste types separated in our skips– it’s to allow for recycling when possible! We are an eco-friendly company and do our utmost to keep from adding to landfill. We cannot accept asbestos or liquids. If you need guidance on what you can and cannot put in skip bins, get in touch and we will be happy to help. Skip bin hire Sheidow Park is convenient and easy to manage thanks to our easy order system. What size skip bin hire Sheidow Park should I order? Skip hire Sheidow Park is great when you book with us as we have a massive range of skip bins on offer. Check out the illustration below for guidance on sizing. If you only have a small amount of waste to deal with then mini skips Sheidow Park are a good choice. Best Price Skip Bins have skip bins for hire of all sizes, ranging from 2m3 up to 30m3, so no rubbish removal job is too big or small! Below are the skips Sheidow Park sizes which we have available. How do I find the cheapest skip hire in Sheidow Park? Contact us of course! Best Price Skip Bins is a family owned and run skip hire company and we have one of the easiest skip hire ordering systems on the internet. We only work with the best skip bin hire companies and have access to them all. Enter your postcode into our online order form to get a quote or to book a skip bin! You won’t get cheaper than us because we use all of our many connections to ensure that you’re offered the cheapest prices out there. Are Sheidow Park skips the best way to remove rubbish? Without a doubt! There’s no more convenient way to manage your waste. You have two options when it comes to rubbish removal. The double handling method or the easy way. Multiple dump-runs are no fun…you have to load and unload your trailer and pay dumping fees! Using skip bins is an extremely convenient and cost-effective method of waste disposal and here at Best Price Skip Bins, we can make it the cheapest method too. A council permit is not required if placing the skip on private property in Sheidow Park. However, if the skip bin is to be placed on public property such as the nature strip, street or footpath, a permit is required. Visit Marion Council to learn more! To book your skip bin with Best Price Skip Bins, get in touch and we will give you a quote or you can order immediately and we can have a skip bin at your door within 24 hours!